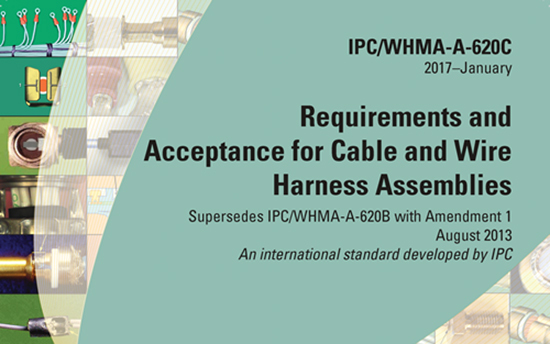 The IPC/WHMA-A-620 Standard Revision C remains the only industry-consensus standard for Requirements and Acceptance of Cable and Wire Harness Assemblies. IPC and the Wiring Harness Manufacturer’s Association (WHMA) continue to work together to develop this significant update. The IPC/WHMA-A-620 standard prescribes practices and requirements for the manufacture of cable, wire and harness assemblies. 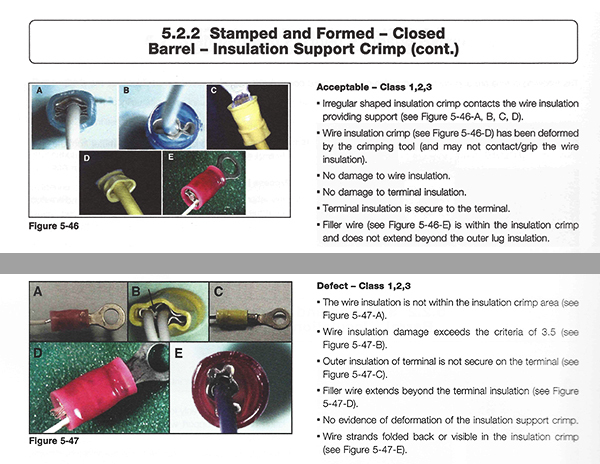 The standard describes materials, methods, tests and acceptability criteria for producing crimped, mechanically secured and soldered interconnections, and the related assembly activities (corresponding lacing/restraining criteria) associated with cable and harness assemblies. Any method that produces an assembly conforming to the acceptability requirements described in this standard may be used. The IPC/WHMA-A-620 standard sets expectations between WHMA members and their customers for what is considered acceptable quality workmanship for cables and harnesses. The IPC/WHMA-A-620 Revision C provides the electronics industry with the most current criteria for the performance and acceptance of cable and wire harness assemblies. This revision includes a synergy with IPC-A-610 and IPC-J-STD-001, aligning many of the requirements that are in common with IPC/WHMA-A-620. Revision C also has over 700 full color pictures and illustrations. 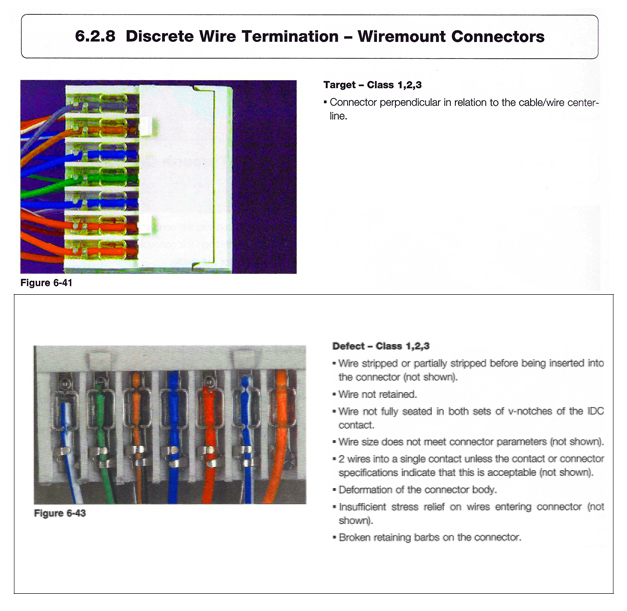 Included in the 19 chapters are criteria on safety wires and prep, requirements for individual wire seals, soldering to terminals, crimping of stamped and formed contacts and machined contacts, insulation displacement connectors, ultrasonic welding, splicing, connectors, molding, marking, coax/biax cables, raceways, grommets, wrapping/lacing, shielding, assembly and wire-wrap terminations. 428 pages. Released January 2017. Use of the IPC/WHMA-A-620 standard requires agreement on the Class to which the product belongs. The User has the ultimate responsibility for identifying the Class to which the assembly is evaluated. If the User does not establish and document the acceptance Class, the Manufacturer may do so. It is an important piece to the process, materials, and inspections standard for the cable and wire harness industry. Includes products suitable for applications where the major requirement is the function of the completed assembly. Includes products where continued performance and extended life is required, and for which uninterrupted service is desired but not critical. Typically, the end-use environment would not cause failures. Includes products where continued performance or performance-on-demand is critical, equipment downtime cannot be tolerated, end-use environment may be uncommonly harsh, and the equipment must function when required, such as life support systems and other critical systems. Since 1957, IPC — Association Connecting Electronics Industries® has been guiding the electronic interconnection industry through its dramatic changes. A global trade association dedicated to the competitive excellence and financial success of its more than 3,300 member companies, IPC represents all facets of the industry including design, printed circuit board manufacturing and electronics assembly. As a member-driven organization and leading source for industry standards, training, market research and public policy advocacy, IPC supports programs to meet the needs of an estimated $2.02 trillion global electronics industry. The Wiring Harness Manufacturer’s Association (WHMA) was established in 1993 and is dedicated to providing its members the technical support, access to leading edge technology and training and peer networking exchanges.